Offering exquisitely renovated apartment in China’s major cities , prime locations and hot tourist destinations. Our dedicated and professional team harnesses the axpereince and axpertise of branded intemational service apartments and luxury hotels-to offer the best of hotel comfort and homely coziness. Our leasing options, by days, weeks and even monthas, make tourist lodging and short-team lease a breeze. With accommodation choices beating conventional hotels in comfort. 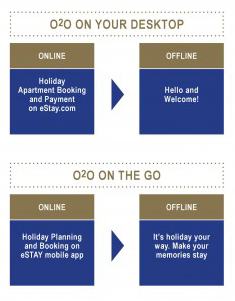 Convenience and rates, holiday-making with eStay is a stay and much more. 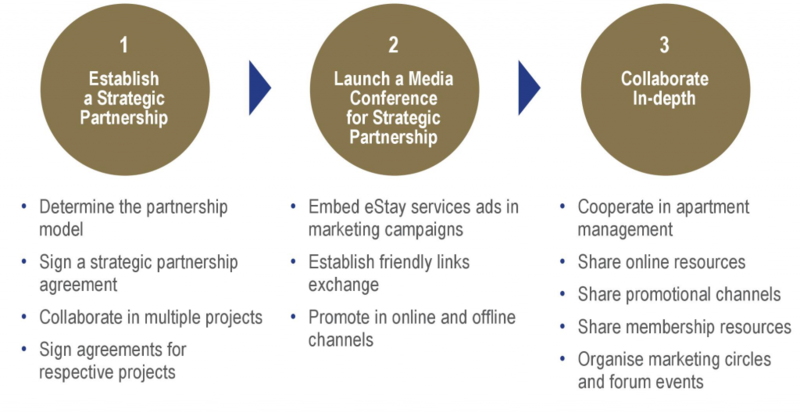 Building a solid online platform with strong technical experiences, brand reputations and business reach to effectively promote and sell apartment on eStay globe and provide value added services of appartment owners , operators and property developers. 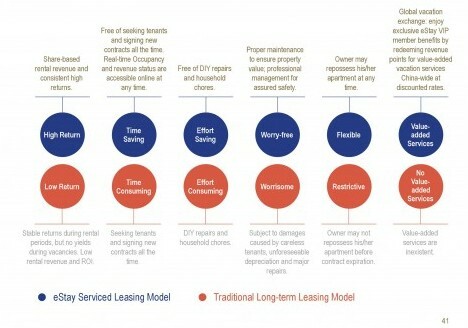 Our fast-growing team is comprised of senior technical and management professionals with intemational experience and what it takes to raise the bar for the holiday apartment lessing industry – with a fully integrated, end-to-end online leasing platform that is improved continually to better serve market needs. 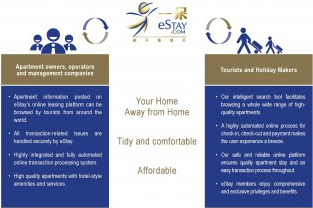 Founded in Hong Kong in 2007, eStay group formally launched its online holiday apartment leasing business in china in 2008. A pioneer in the fiels, eStay attributes its success to one principle, stay focus in understanding and meeting the needs, of property developers, apartment owners and holiday makes now and in the future. 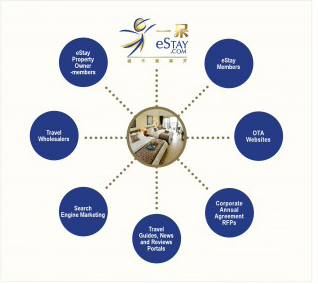 With a mission to create a whole new travel accommodation approach and eStay group established tour branded apartment offerings: eStay residence, eStay Resort, eStay Vila, eStay Apartment to serve the needs of high-end to mid-range holidy makers. 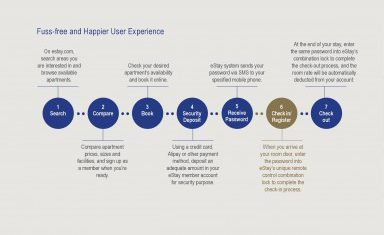 Relying on the Group’s proprietary technology and system, eStay members enjoy the convenience of electronically booking and checking in and out of eStay Residences and eStay resorts, It’s as sure and easy as returning home, you can call it truly a home-out-of-home travel experience. 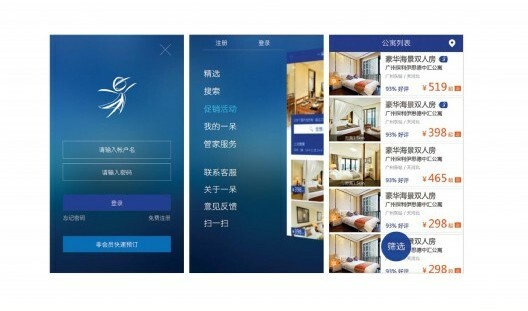 To be a bigest online holiday apartment leasing platform and the leading brand in china .Though quality , innovation and efficiency in our service delivery.We will enhance property value for holiday apartment owners and create memorable experience for holiday markers with hotel comfort , Homely coziness and more. 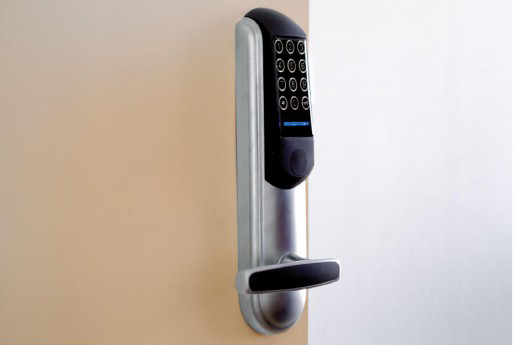 Our brainy technical team has equipped all eStay apartments with propriety remote control passcode-protected door lock nad second generation identity card recolonization door lock system. At the same time ,the team has build a tried and tested online booking and transaction system that is easy.safe and secure to use.At its core is a powerful and protected backend administration system.Which includes bookings, membership and finance to deliver formidable technical assurance for all eStay users – staff and customer alike . 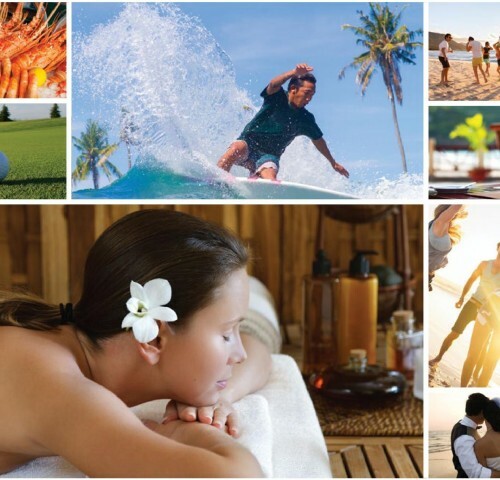 Guan king bring with him more than 15 years of experience in leisure. 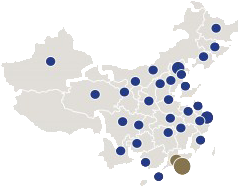 Resort and hotel management and business development across four contains notably in Singapore , China , Arab countries , USA and australia. His past experience includes an illustrate toue with the Ascott group of singapore. 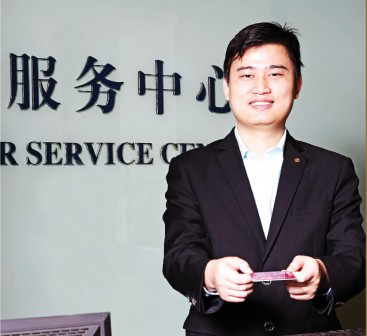 The worlds largest international serviced resendance Owner operator during which he successfully led the launch of global flagship store Guangzhou Ascott ,IFC and won China’s best hotel service apartment award 2012. At the group’s headwaters in Singapoure.He went to on manage two of Ascott’s branded residence namely. Somerset and Citadines. Earlier on he took office in the Marriott Hotel and Resort Group to manage the Marriott Beach and Golf Resort in South Carolina USA. Gusn Kiang graduated form University of London with a major in Computer and Information System Major, and form University of Western Sydney with an MBA in Hotel Management. Bill has 15 years of experience in real estate spanning residensyal, commercial, cultural and tourism,retirement, and parks. He hed help senior executive positions in Wanda Cuttural industry Group and HNA Property Holdings with more then 100 projects under his belt and over RMB 100 billion in sales achievement. honoured ‘Famous Real Estate Mcrobiogger’ repeatedly and is well known as an internet marketing expert. Bill graduated from Northeastern University with an MBA. He ourretly services the National Reak Estate Manager Alliance as the deputy secretary general. Maurice has over 10 years of management experience in five-star international hotels, including the opening of three Starwood hotels (Sheraton Shenzhen, The St. Regis Singapore and The St. Regis Shenzhen). He was Chief Butler of The St. Regis Singapore, where he led his team to win the honorary “Best Team” title, and his department to come in tops in L&A adult for two consecutive years. for China’s current president Xi Jinping in 2010 and former president Hu Jintao in 2009. Other extraordinary guests he had served include Saudi Arabia’s Queen. Oman’s royal family and important government officials. Maurice graduated from Les Roches International School of Hotel Management with a bachelor’s degree, and obtained a master’s degree in hotel and tourism management from Universite de Perpignan, and a master’s degree in hotel management from institut Vatel. Roger has more than 12 years of work experience in holiday and serviced apartments, holding important managerial posts in various world renowned enterprises. While employed with the Ascott Group of Singapore, he successfully led his team at Citadines Xinghai to achieve the best annual performance since six years of its opening. 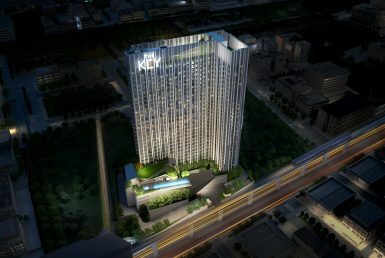 Concurrently he took full charge of the pre-opening works and the succesfull launch of Ascott Midtown Suzhou. He had also managed the marketing and sales at Somerset, a brand of Ascott. He was awarded the Certificate of Management of Serviced Apartments and Pre-Opening of Properties by Ascott headquarters. Prior to joining Ascott, Roger was customer relations manager. China at Camival Cruise, the world’s largest cruise company, and VIP services manager at Star Cruises. 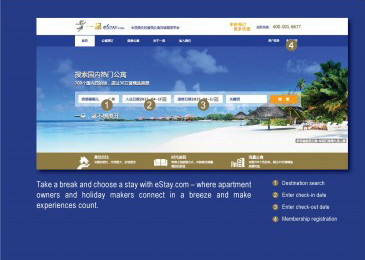 eStay prides itself as the pioneer and leader in China’s holiday apartment online leasing industry, with arguably the largest membership count. We provide end-to-end services – from holiday apartments search to booking, payment, check-in, check-out, settlement and room status – on a one-stop platform. Massive accommodation choices. 208 destinations nationwide. 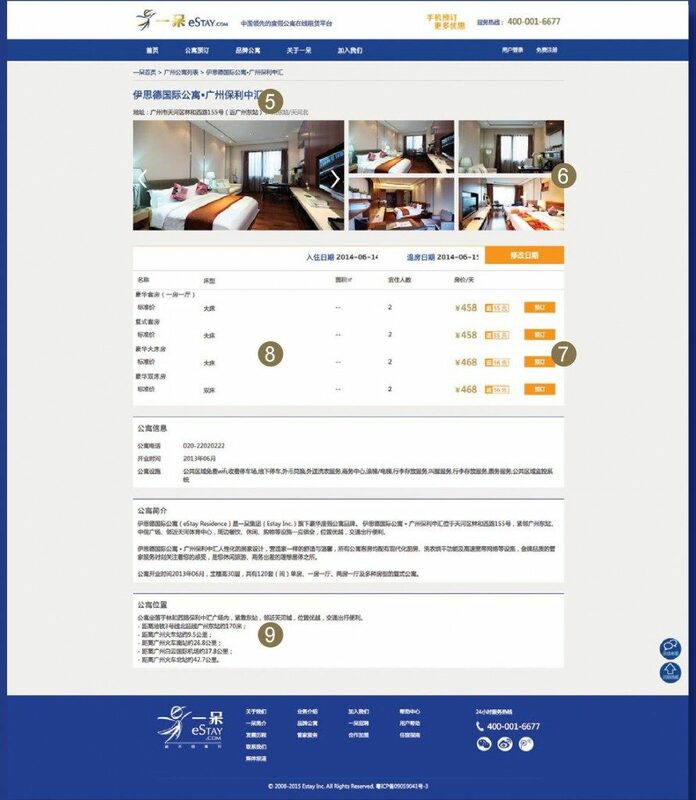 More than 300,000 properties Comprehensive online marketing channels with long-term SEIWSEO campaigns to ensure optimal lease-up rates. 24×7, all-weather learn to cover the needs of our customers any time, everywhere. 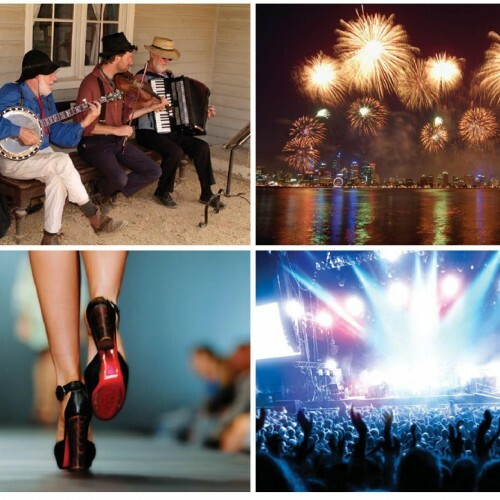 Themed Activities page offers a wealth of promotions and discount information that you’ll not miss out. deliver your needs just-in-time, and an experience of a lifetime. 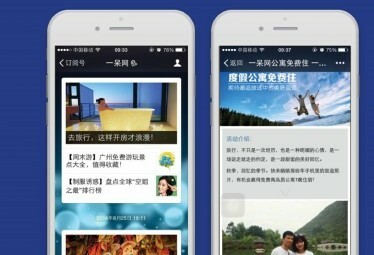 Get eStay mobile app. – developed by our technical team. rich commoners could not indulge. homes of the middle-class and social elite. 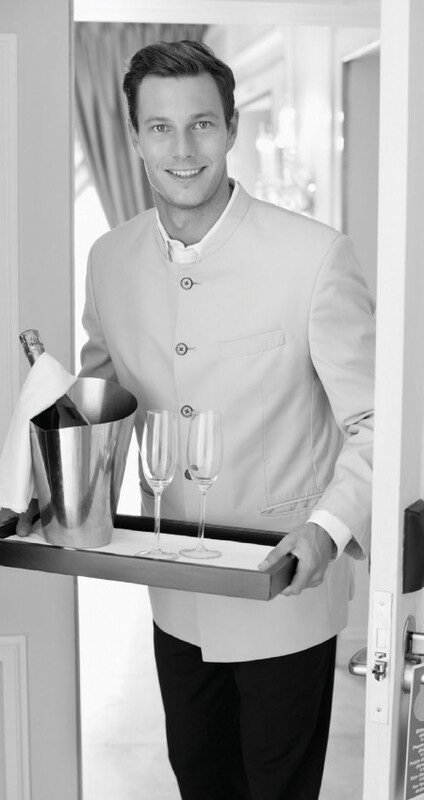 For the first time, eStay has introduced the famed butler serviceto china . Apartment owners may now enjoy what was once anultimate luxury for the royal and noble. international team. Prime locations and modern kitchens combine with Buckingham Butter Service to cearte extraordinary experiences that business and leisure travelers alike will not forget. We always pay close attentions to details because we see you as an extended family member. At eStay we pride ourselves to make your every stay with us a fabulous experience that’s as good as gold. 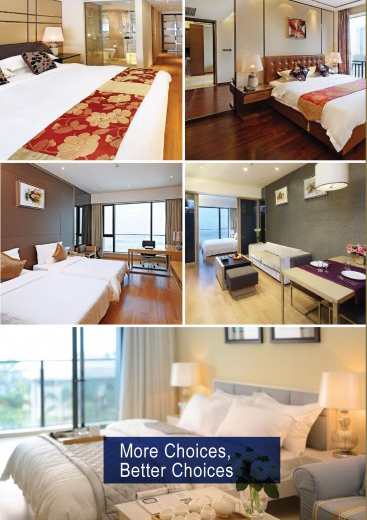 to international five-star hotels and serviced apartments. gift – the sea, the beach, and the sun beyond the horizon. Stay away from the maddening crowds and take a therapeutic dip into a steamy hot spring in your luxurious, five-star quality suite – brought to you by our experienced international design team. reserved only for the well-heeled. your home and as cozy as hotels. 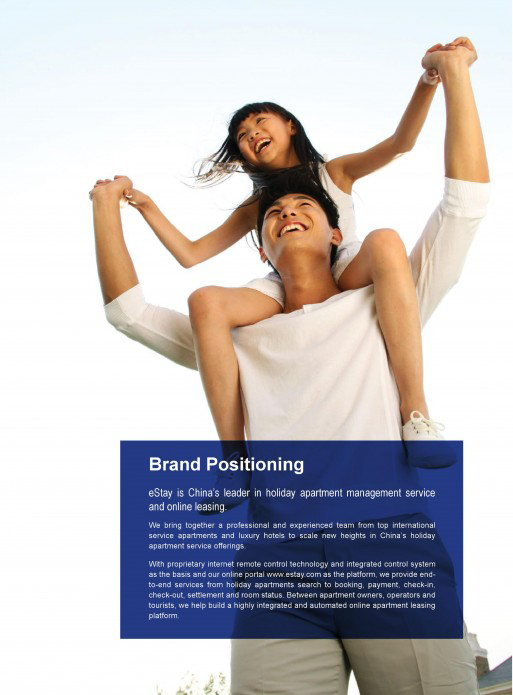 An advanced international model for holiday apartment leasing. professional hotel-style services, comfortable rooms with elegant minimalist interior design, and an efficient and cost-effective management system combine to make the eStay Apartment experience possible. Experience our Deluxe king-size Rooms. 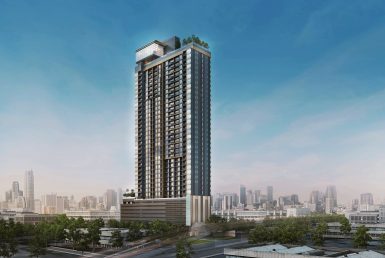 From people-oriented interiors to fully equipped modern kitchens,high-speed broadband WIIFI connectivity and cabled (satellite) TVs, you’ll find yourself very much at home indeed. When it comes to renovating and decorating a property, our well-travelled interior Design team has only one mission in mind: create a living space with a distinctive style that is at home with the surrounding theme and attractions, and furnish it with soft touches and much holiday vibe. Leveraging on the extensive resources gathered through our years of holiday apartment leasing Operations, eStay handpicks only the best of large-scale, local furniture manufactures and furnishingsuppliers, to deliver turnkey interiors customization services. 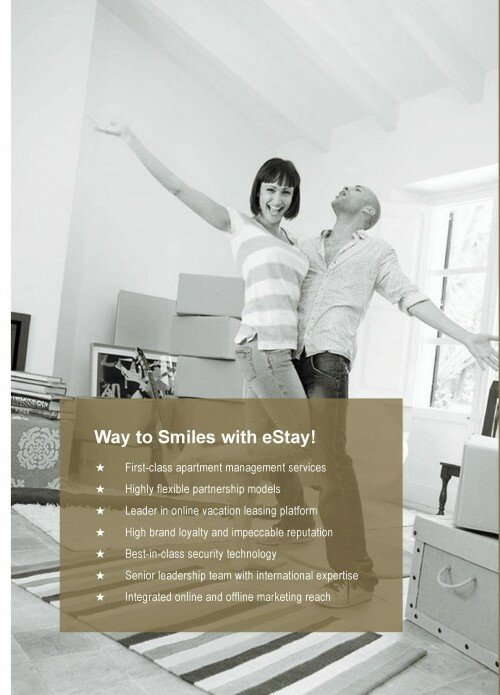 eStay helps you, the owner, save on extort,money and heartaches to turn your property into an ideal holiday apartment. We strive to extend our brand reach beyond travel accommodation by integrating and leveraging on resources in properties’ vicinity to meet the growing customer demands for lifestyle holiday experience. We’ve bundied our apartments with dining, golfing fishing, spas and other offerings, with our eyes set on building a vacationing ecosystem for the future. Beach culture – take a dip’n dip! constantly reaching and engaging our loyal customers across the globe – online and offline. Our professional and international operational framework allows the property owner to access real-time, fully transparent lease revenue information on our backend system. Rest assured, we aim for every owner’s continuous and steady returns. We anticipate and offer a variety of services to meet travelers’ needs by establishing alliances with merchants within 1, 3 and 5 km respectively of our properties. We make out-of-home shopping and spending both convenient and assured. We make special deals and discounts a reality even when you’re on a holiday. We’re fully online, so holiday products near your stay is just a click away. The Internet is a product of its time, and so is the holiday apartment. A convenient and assured holiday lifestyle is possible only with the best use of the Internet.When thoughtfully integrated, online resources will certainly add variety to your holiday. From leveraging resources to enriching the holiday experience, mobile Internet makes everything a go! 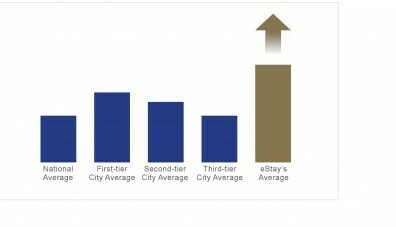 famous tourist areas has become a major factor with a significant impact on the the property developer’s brand value.If these apartment are allowed Into the noisy short-rent market with doomful management standards, they must face the rude reality of apartment management chaos, property quality decline owner dissatisfaction, and ultimately irrecoverable damage to the brand value of the developers in the long-term.By choosing eStay as a strategic partner, developers can expect us to independently manage their apartments in major cities and famous tourist areas with world-class managements thinking and actions to improve quality. Liberate them from present and future woes. And ultimately increase their brand value. 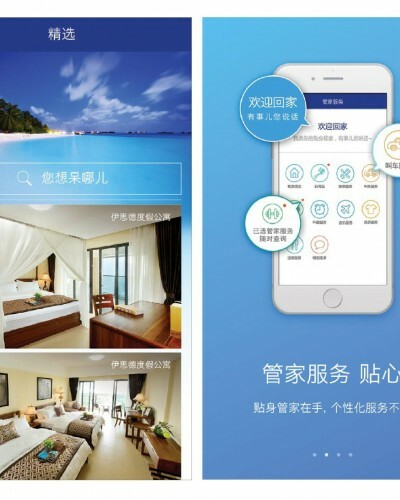 As china’s forerunner and leader in online vacation legation and management service provider eStay is relentlessly forging stable. Long-team partnerships with real estate developers, advices to delivering design construction media promotion sales and after-sales services for apartment related products. Marking woes add value to their Brands boost property sales, and enhance after-sales service. By choosing eStay as a leasing operator and manager, property owners will find our world-class apartment management system, powerfulonline platform and massive membership base an engine for steady and high yields on their properties. 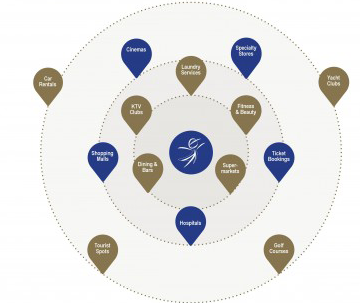 eStay’s confidence stems form the quality built by its remarkable international team and the rental level propelled by its millions of members with high spending power. 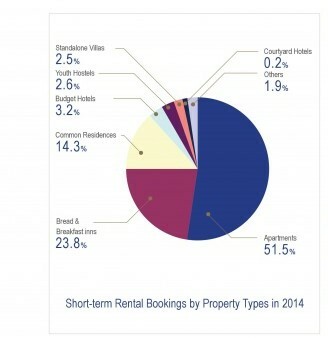 The trend of short-term vacation rentals towards serviced apartments acts as an industry catalyst. 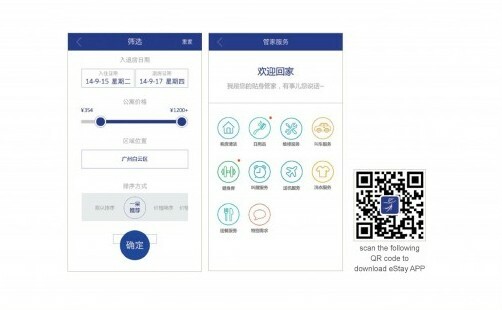 Description * eStey acts on behalf of the property owner and exercises full decision making power on online leasing and value-added services. 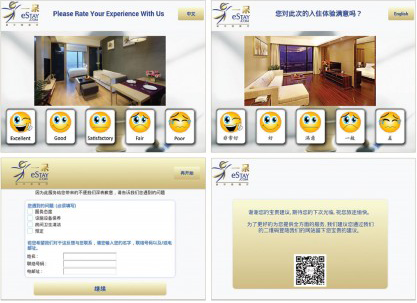 Value-added Servicess * The property owner is entded to use estay’s bademark and branding. * estay’s proprietary door lock system. * Hotel-style room facilnes and supples. * handing of transactions and peyment processes. * on-site apartment management service.